Kids seem to like this series. It is goofy. Lots of pages with few words and containing black and white illustrations. If they like Diary of a Wimpy Kid, consider this series too. There are now seven books in the series. This is an easy way to transition from the Easy Readers to Chapter Books without feelings of intimidation. Reading level of 3.8. An interesting take on the survival story. Ros, the robot, is stranded on an island. She is willing and able to learn survival techniques from the animals on the island. Eventually, she becomes a mother figure to a goose but disaster strikes when other robots come to capture Ros and take her “home”. This is better for your younger reader as there are a few plot holes with this one. Reading level of 5.1. Field trips don’t get much worse than this! On a visit to Carlsbad Caverns, students are separated from the adults when an earthquake sends them plunging into the earth. Unfortunately, they find themselves in the midst of an underworld war and being attacked by mutant animals. The students surprise themselves with their ability to work together and find the hidden strengths which will help them survive. This is a well told, fairly short, story that leaves you sitting on the edge of your seat. 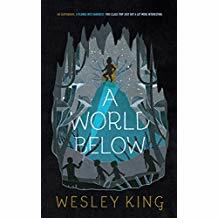 “A World Below” has a reading level of 4.7. 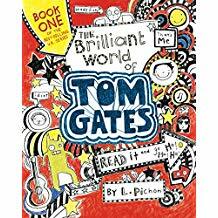 Tom Gates is a young, artistic boy who spends more time doodling in class and dreaming of his favorite rock band than he does worrying about turning in his homework. You will laugh even as you shake your head at this well illustrated little book. Reading level of 4.0. Fitting in is hard to do. 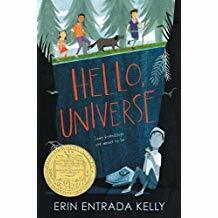 The kids of “Hello, Universe” have a hard time fitting in at school and at home. “Psychics”, nerds, bullies, and a young girl with a hearing impairment try to find a place for themselves in an indifferent world. When one of the kids goes missing, they will each need to harness their talents to bring him home. The author portrays the “outsider” well and utilizes myths and folklore in her story. Winner of the John Newbery Medal. This book had a “fantasy” feeling to it as it portrayed unrealistic situations. Reading level of 4.7.